World Nylon Fiber Report, Global Consumption of Nylon Filament Yarn. In 2014, apparent consumption in West Europe declined 1.5% year on year while domestic supplies shrank 8.9%. 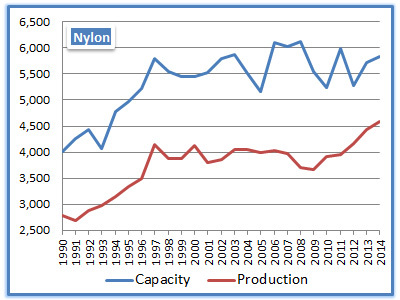 YnFx predicts that nylon consumption would touch 5.10 million tons by 2020, increasing at an annual rate of 1.3% since end 2014. Global nylon monofilament market demand is expected to reach 476,400 tons, growing at a annual rate of 5.2% up to 2020.